Pickling’s never been easier! Simply place your vegetables in our ready-to-use, expertly blended pickling vinegar and leave to develop delicious flavour! Distilled Barley Malt Vinegar, Natural Spice Flavourings. 6% Acidity. Allergy Advice: For allergens, including cereals containing gluten, please see ingredients in bold. 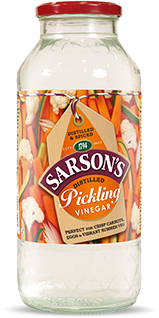 Sarson’s Pickling Vinegars are brewed to a special pickling strength so that your pickles will be better preserved. Comes in a special pickling jar which you can use again and again.